Shankless pointe shoe to aid in the preparation of pointe work. Broad feathered toe box with lightly pasted wings. Medium length vamp. Round shaped throat. Hand flattened crown. Cotton lining. Nylon binding with elastic drawstring. Short leather outer sole. Full 3.5mm DRYZ® socklining. Pointe Shoe "Starlet" by Pietra (Merlet) with 1/4 sole. 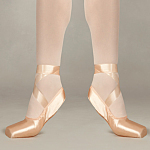 Can also be used as a Demi-Pointe.